Welcome to the first major fan site for soulbelly. This site is dedicated to supporting the existing fan base for soulbelly and helping get the music out to a broader audience. 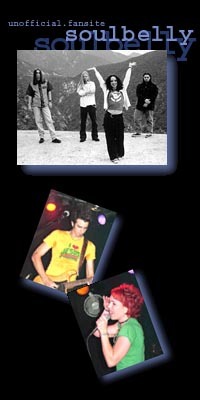 Unfortunately, soulbelly disbanded on Tuesday, January 15th, 2002. They've even taken down their official website. My name is Gerrit. I first heard soulbelly at the Roxy in Hollywood. I purchased their CD, simple.chaotic, shortly before creating this fan site and it's outstanding! Check it out! Do you use Yahoo! Messenger? Have I got a skin for you! I aspire for this site to be THE location for soulbelly fans to get together online.